Help for Self-help. This is the guiding principle by which Menschen für Menschen Switzerland has been working for over thirty years in Ethiopia. This principle is grounded within the vision to supporting the poor in Ethiopia help themselves. Ethiopia has been undergoing major social and economic changes in the last few years. Population growth, erratic weather, combined with the devastating effects of climate change, causing severe droughts, and overused farmlands have led to an increase in urbanization. People migrate to cities in hope for a better life – only for most to find a new kind of hardship there. That is why the foundation has decided to work urban areas, as well as continue working in rural ones, aiming to halt poverty and enable opportunities for better a life. Many children grow up in extremely poor families. Parents cannot even provide enough food for their children. We provide these children with food and free meals to ensure their health development and success at school. Children abandoned by their parents and other orphans find a safe home in the Abebech Gobena orphanage with prospects for a happy life. Many Ethiopian women see only one way out of their material hardship: they travel to the Gulf States as guest workers, some of them illegally. There they often lead a life as working slaves, are exploited and abused. We offer an alternative to fleeing their homeland: In a six-month course, we train particularly poor women as housekeepers and for the service industry and turn them into sought-after experts. Poverty easily passes from one generation to the next. 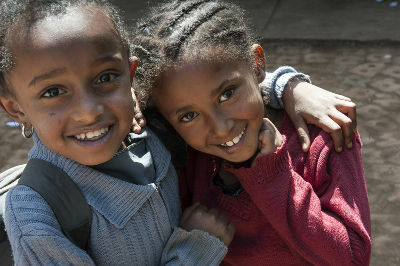 We are improving the lives of 1,000 of the poorest children in the city of Debre Berhan by helping their parents find work amongst other things. We want to help the children escape the cycle of poverty by improving their access to education. The population grows by 3 percent every year. Between 0.25 and 1 hectare in size, the farms cannot provide enough food for the booming population. As a result, an average family only has enough food for half the year. The farmers get help to improve their agricultural productivity and their income. The Afar nomads are threatened by climate change. Their herds in the drought-stricken savannah region can no longer find enough food. And the herders are also suffering as a result. We are developing irrigation systems and showing the nomadic people how to grow vegetables and crops, giving them survival alternatives for their families. Shewa Robit, a city of around 50,000 inhabitants, is at the mercy of a particularly distressing sanitary situation. 47 procent of households have no toilet or latrine. People have to clean themselves in the nearby river and take care of their emergency needs on the shore. Unemployment and prostitution are rife. We want to change this with our WASH project which includes environmental initiatives and ventures to generate income. Up until 2014, the work of Menschen für Menschen was shaped by the concept of integrated rural development. In the process different and predetermined measures were put in place in the areas of water, education, agriculture, health, women's projects, infrastructure and general social aspects. These areas were interlinked in programs for entire regions. This was useful and successful for the rural poor. However, the needs of the people in Ethiopia have changed rapidly. Focusing on the rural population alone is no longer appropriate. Overpopulation is one of the most pressing problems in Ethiopia. The people can no longer live from the food they produce. The model town of Buranest creates a well-designed concept that enables all the basic needs that people have in urban and rural settings to be met. Menschen für Menschen has built cisterns to ensure the water supply even in dry seasons. 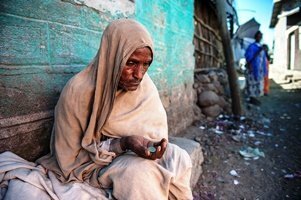 In 2016, Ethiopia experienced the most severe drought in decades. These recurring droughts are impacted by climate change, causing food shortages for many people. Worst off are the young children. We are constantly monitoring the situation. In times of emergency we distribute protein-rich supplementary foods. This is done in particularly affected areas, in order to support children and prevent health related risks from food shortages caused by the drought. Abdii Borii means "hope for tomorrow" and that is exactly what this home wants to offer the boys and girls who live there. The children who live in the home are often orphans with bad childhood memories. The children's home provides them with food, clothing and medicine as well as a basic school education. Menschen für Menschen started working in the project area of Asagirt in 2007. At that time, the healthcare provision was very poor. Drinking water was often unclean, causing lots of disease. Thanks to Menschen für Menschen it was possible to significantly improve the health care and water supply by 2014. Menschen für Menschen started working in the project area of Hagere Mariam in 2008. Soil erosion was a crucial problem in the region. Thanks to the loyal support of Swiss donors, more than 60,000 people have been given the chance of a better life. The project was handed over to the local government in 2014. The foundation started working in the project area of Merhabete in 1992. The region had been afflicted with continual draught. With the help of erosion protection measures, terracing and irrigation, new farmland was created. As a result, no emergency aid has been required since 1995. The project was completed in spring 2010.